The cup is made of medical grade silicone and comes in one color: pink. (This cup is not dye free.) It has light ridges around the top of the cup (below the lip) and also on the bottom of the cup and stem. This cup does not have any features that would make it easier to insert. This cup does not have any features that would make it easier to remove. Like most other menstrual cups, this cup comes in a small and large size. Choose the smaller size if you are under 30 and have not given birth, and the larger size if you are over 30 or have given birth. This cup has less prominent ridges than most cups and no engravings or gradations, which should make it straightforward to clean. Because it comes in a two-pack, you could even take the time to steralize the cup between each use during your period so you always have a completely clean cup to use. While the cost of the LolaCup is middle-of-the-pack, it does cover two cups while the others only provide one. Having another cup can be handy, whether you want to stash them in different bags, leave one at work, or give the other to a friend. 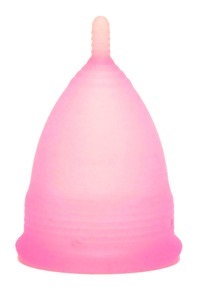 This menstrual cup is manufactured in the United States but is not registered with the FDA.